Xiao Dong's university records show he is "employed," but the fresh graduate is still struggling to find a job in Beijing. "Only 10 out of the 29 students in my class have found 'real' jobs," said Xiao, who studied at a leading Chinese university. He would not give his real name because he wanted to "maintain good relations" with his school. "But our university still boasted that about 90 percent of its graduates have become employed," he said. Xiao is one of many students who are proof that universities continue to produce bogus job figures of their graduates to boost their stature. Authorities have insisted that most universities and colleges are "very serious" about the employment rate and that the latest reports of those faking their rates are highlighting "individual cases." "Most of the figures the universities provide are accurate," Ministry of Education spokeswoman Xu Mei said at the latest press conference to address the issue this week. "We will strengthen supervision on universities. Schools found to be faking figures will be punished," Xu said. 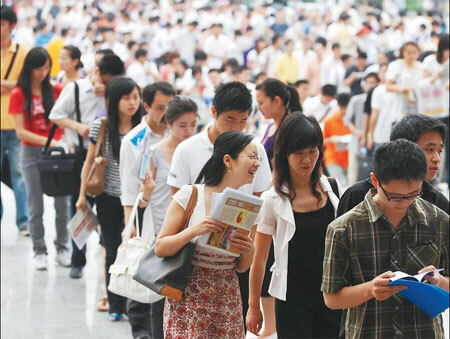 Ministry of Human Resources and Social Security spokesman Yin Chengji said that the ministry will pay close attention to the fake employment rates, and will take all necessary measures to help students find "satisfactory jobs." Amid the global financial crisis, the record 6.1 million fresh college graduates are having a difficult time finding jobs. The country's urban registered unemployment rate increased to 4.3 percent in the second quarter. But the official figure of 68 percent employment rate of the college graduates by July 1 mirrored the statistics for last year, when there was no economic crisis. This triggered suspicions about the authenticity of the number. Subsequently, several media have reported that some universities have been faking job contracts for graduates. According to unwritten rules at many universities, students cannot graduate if they do not find a job. Many unemployed students have to buy a fake job contract or employment agreement from small companies so that they can get their graduation certificates. Beijing Vocational College of Finance and Commerce, for example, refused to issue the graduation certificates to 20 students who failed to produce any employment papers, China Youth Daily reported yesterday. Last week, Zhao Dongdong from Northwest University of Politics and Law said in a web forum that his university gave him a bogus work contract to inflate its post-study employment figures. "I have heard a lot from my friends and classmates about different methods of cooking up employment papers," Xiao said. Officials at his university suggested that he find a local human resources agency in his home province that can offer employment agreement papers, he said. Such agencies under the administration of local labor departments charge about 200 yuan ($30) per year for an administration fee. But they do not provide any job. Since 2003, when the higher education system in China was expanded, a university's graduate employment rate has become a major tool to evaluate its education quality. The rate is based on the data collected before graduation. Chen Yu, director of the China Institute for Occupation Research at Peking University, suggested that the education ministry should stop the assessment of employment rates of universities before graduation and compile the statistics at least six months after. "The universities should put more efforts into helping unemployed graduates find jobs after graduation instead of cooking up employment rates," he told China Daily yesterday. "A good university should track the development of its graduates and give them long-term support," he said.